About 10 years ago I wrote the statement below, It was the summation of what I had learned after 15 years, knowing both triumph and tragedy, relentlessly pursuing the sprit of aviation. “At any real level, flying is not a sport, a hobby, a pastime nor entertainment. It is An Endeavor, worthy of every hour of your life you invest; Those who dabble in it find only high cost, poor reward and serious risk. They are approaching it as consumers. Conversely, for those who devote their best efforts and their serious commitment, the rewards are without compare.” -ww. I honestly thought that if I could distill what I had learned to three sentences, and the truth in them was very plain, that a great number of people would have a person course correction in aviation, and re-align their own personal efforts to focus on the timeless rewards which the most committed have always known. I was wrong about this. What did I get wrong? While we have several hundred committed, traditional builders in the Corvair movement, These people are a very small fraction of homebuilding, and the words above have had very little resonance outside the world of Corvairs. It comes as no surprise that people with consumer “buy and imported motor in a box” mentality, the people who thought Why “Made in America” matters to me. was gibberish, people who believe and repeat myths like Rotax 912s being more reliable than Lycomings, do not have the ability nor the desire to understand the three sentences. While I am willing to co-exist with these people in aviation, as they are now the large majority, I have never been concerned that the don’t ‘get’ traditional homebuilding values. I try to follow my own path that rarely puts me in proximity with those people; I don’t read magazines or websites devoted to consumer aviation, I don’t attend EAA meetings where the conversation is dominated by things people bought rather than things builders made, and I find other places to fly and better company to keep. Life is too short, and my remaining seasons in aviation too few, to waste time near such people or those catering to serve their mentality. Here is what does concern me: I was not correct when I thought that everyone attracted to traditional homebuilding values would automatically be driven to make aviation the exceptional, outstanding part of their life. While we all have many parts of our life where we do enough to be ok at it, I believed that nearly everyone drawn to traditional home building’s Learn, build and Fly creed would understand the clear choice presented in statements like: Thought for the Day: Mastery or?. If I am truthful, I have to say that people like the sound of the ideas, but we are immersed in a 24/7, all pervasive consumer society, and people have a hard time leaving that outside the airport fence, and making the choice that what they accomplish in aviation with be the outstanding part of their lives, not just another thing they did ‘OK’. A concrete example: In 2015 we had four people with Corvair powered planes destroy them in stupid, completely unnecessary accidents. They only good thing to be said was no one was killed. In spite of the fact I have written countless, direct stories like this: “Local Expert” convinces builder to use cast pistons about NEVER following the advice of a self appointed expert, a common thread in each of the four accidents was every one of them having a ‘local expert’ assure the builder that the exact part that was wrong, was fine. Now follow this closely: These airplane owners had likely gone through their whole life, resisting learning any skill that they perceived one of their buddies to have, they didn’t read and learn for themselves outside aviation, and they drove through the airport fence with the same mentality. Everything I wrote made zero difference when it counted most. Think that is limited to four accidents? Look into my crystal ball: I get email and letters and calls every week from builders that all include ‘I have a friend who is an A&P/Race Car builder/Electronics expert’ helping me, and he read that stuff so I don’t have to.’ I have people who come to Corvair Colleges, and hold up a part, still sealed in the plastic, with the instructions inside, say “Just show me how to put this on.” They didn’t drive to a college to learn anything, they only went there because they couldn’t find a ‘local expert’. While these people just seem a bit lazy to outside observers, I think of them as names on 2017, 2018 and 2020 accident reports. How did I get this wrong? I did because all the people I choose to spend my private time in aviation with are people who are only interested in mastery of the segment of aviation in front of them. This created the illusion that this was the path that everyone would take. The best example I have is Dan Weseman, who is always in pursuit of everything he can get out of and master in the branch of aviation he is working in. If you have not read it, look at this: Panther Roll out. to understand the depth of this. This doesn’t just cover professionals, but people like Tim Hansen: 100 HP Corvair, Tim Hansen , Persistence Pays who set their own personal standards at mastery, and nothing short of it. Because I was largely surrounded by friends who felt the same way, I missed just how many people can read a philosophy and they say, “Yeah, that’s great, but I’ve got a guy here who says it will be alright”. The most important part of this story: The odds don’t apply to you. It doesn’t matter if 25% of the people who arrive at their first college didn’t read the part of the prep notes that said I will not install parts for people who didn’t read the part instructions. It doesn’t matter that 20% of the builders have a ‘local expert’ advising them with brilliant phrases like “It will be alright”, and it doesn’t matter that many people will get nothing out of the hours they spend muddling through aviation. It doesn’t matter because you are an individual, you will set your own path and standards, and run your own program. The beauty of the system is that this is an arena where you are in control of your own destiny, and you can take all the credit for your progress achievements and triumphs,…..and in the quiet hours you can wonder why anyone else who had the same opportunity as you, refused to take it. 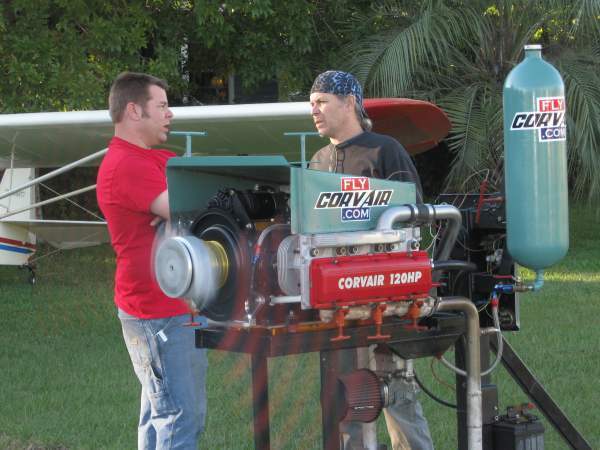 Above, Dan Weseman and I stand in my front yard; This was the first run of the Panther’s engine. Although we have fully independent businesses, our products, teaching and philosophy mesh, and this directly works for both builder progress and learning. I have known Dan for almost 15 years, and for the past 10 we have lived at the same small grass airport. For each of us, homebuilding isn’t a hobby nor even a job, it is a calling. Over 25 years of work with homebuilders it has long been obvious to me that every new homebuilder needs trusted and experienced mentors, who painstakingly acquired the knowledge and experience the new builders are working to master. A successful plane is built from a comprehensive plan, guided by mentors who know the skills from making the first part to flying it. Dan and I have both have a very long track record of being this kind of guide to countless homebuilders. For years now I’ve sat outside the arena wondering if I had the skills to join the ranks of people that call themselves “homebuilders”. I’ve slowly discovered my biggest hurdle isn’t money, it isn’t time and it certainly isn’t desire. It’s been a lack of self confidence in my skills to build and complete an airplane. William, your lament is not related exclusively to aviation. This state of affairs exists in most technically demanding fields. I have been involved for more than 40 years in the engineering tools behind broadcasting and music production. People have been sold the concept that arriving at their stated goal more quickly results in increased satisfaction. Two weeks to taxi must certainly be better than two years. In music recording, it started with the Portastudio and the MIDI synthesizer. No one will ever confuse a home studio mashup with the Chicago Symphony, but that doesn’t stop the people selling home studios, and there are far more people with dollars in their pocket to buy stuff than there are people with the focus to do stuff. It’s about a mercantile society where people live to sell things, rather than to make them. If you don’t derive any satisfaction from the continuous process of learning craftsmanship, you’ll not understand why craft matters. Some small consolation perhaps; or a reward of sorts; I personally feel elated by your writings, your philosophical views are received with the same awakening interest as your technical instructions. You cannot reach everyone. May well be an indication of the times we live in. My father and his friends were of the opinion they could accomplish anything they desired. And they did. But that was after WW2..